We didn’t visit many churches on this trip — Europe is stuffed with them, and no matter how impressive they are, they tend to blur together after a while. 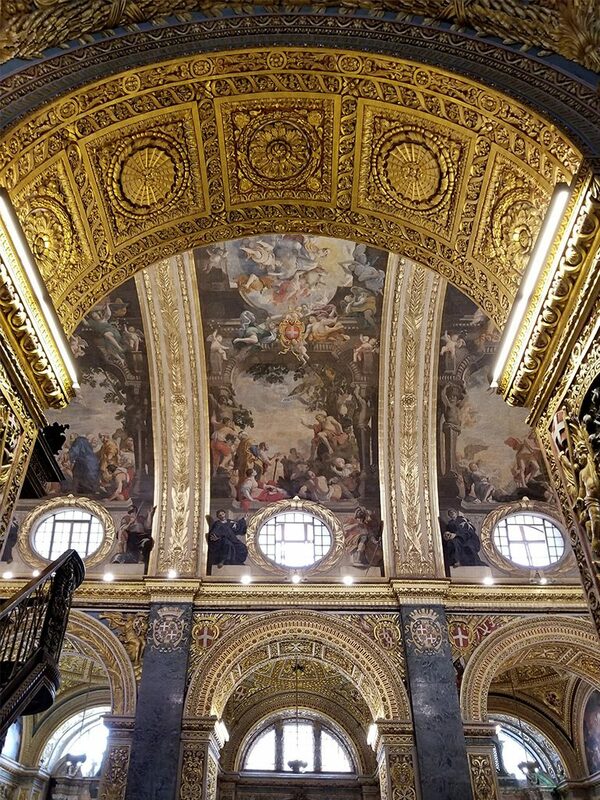 But we did visit St. John’s Co-Cathedral in Valletta, partially lured by the famous Caravaggio painting hanging in its oratory. 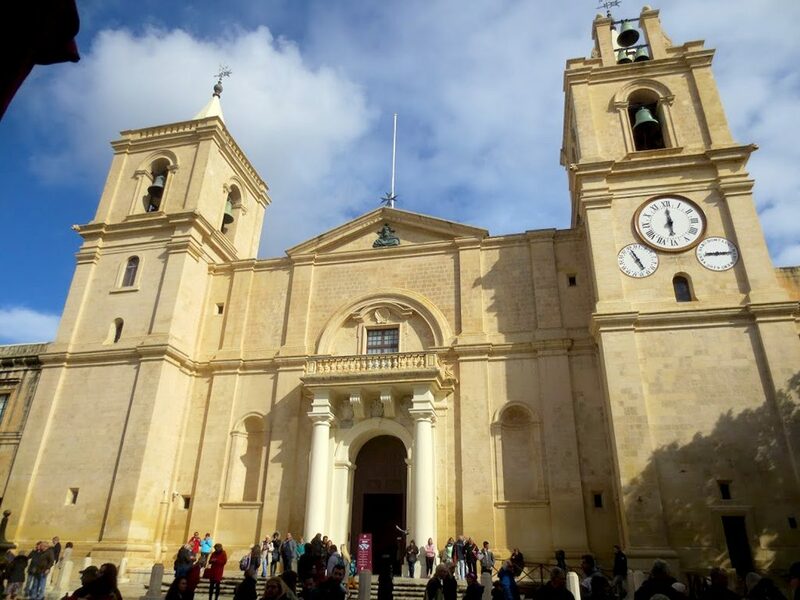 The Cathedral is enormous, taking up the equivalent of several blocks of Valletta, and as a result it’s pretty hard to photograph in its entirety. This was the best I could do despite pushing myself to the very back of the facing restaurant patio. Like many similar cathedrals, the blockish functional exterior is a contrast to the ornate interior. Apparently, when the Cathedral was first completed in 1578, the general mood was sombre after the recent Great Seige of Malta. Out of respect, the Cathedral was left quite plain at first — only later was it decorated to provide an appropriate awe-inspiring decor. 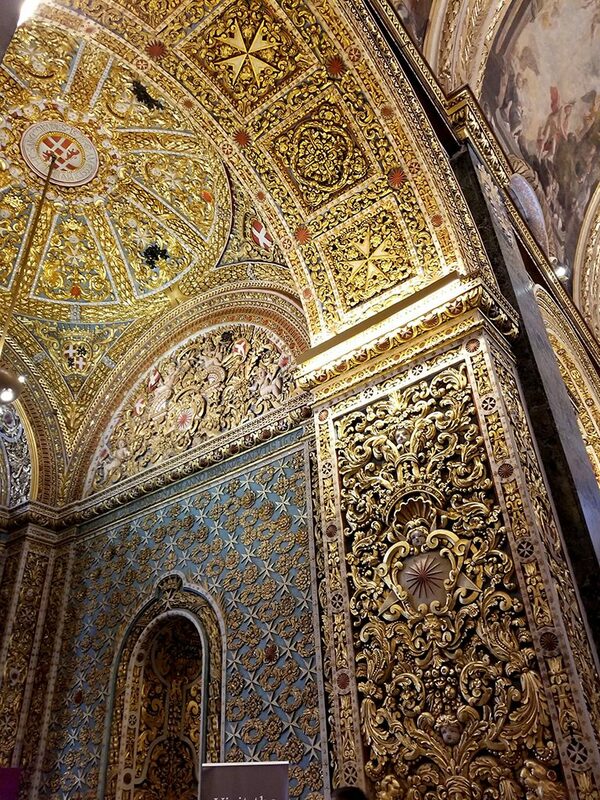 Now it is an explosion of Baroque detail, with every surface covered in intricate carvings, paintings, marble, or gold leaf. Up close, it’s hard not to be impressed by the sheer effort that must have gone into creating every part of the interior. 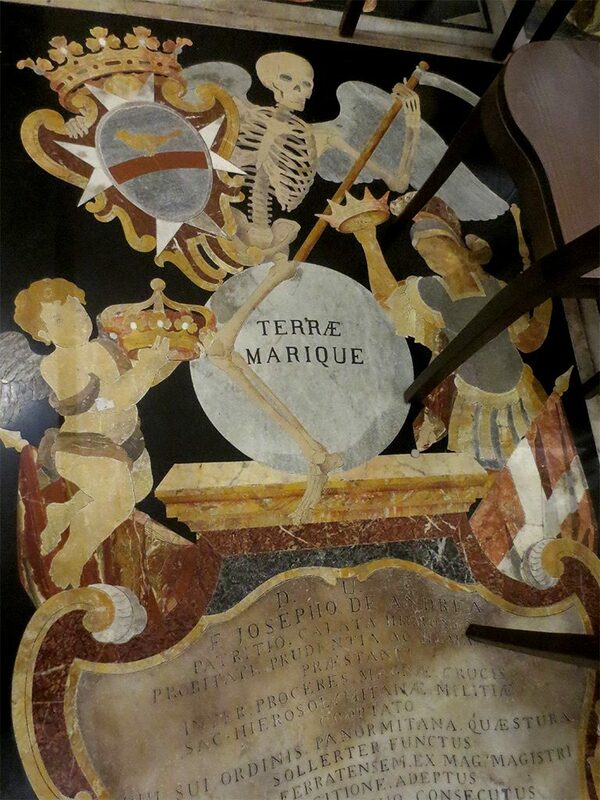 As in the Co-Cathedral in Mdina, the floor is covered by tombs, each delineated by smooth inlayed marble slabs honouring those buried beneath — mostly knights — and featuring plenty of skeleton imagery. Your favourite 1980s heavy metal band got all their ideas here. 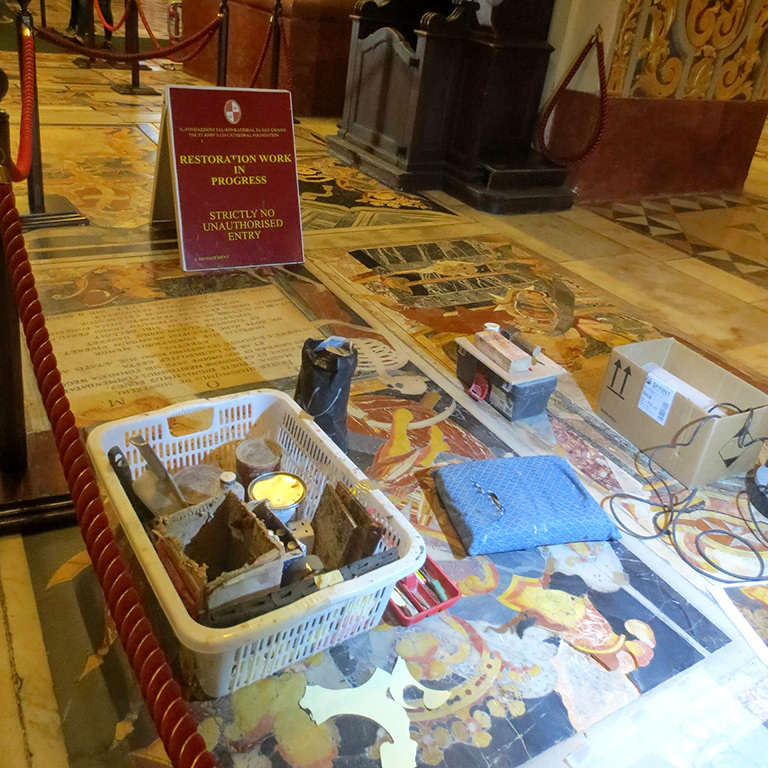 We came across one area of the floor that was undergoing restoration. 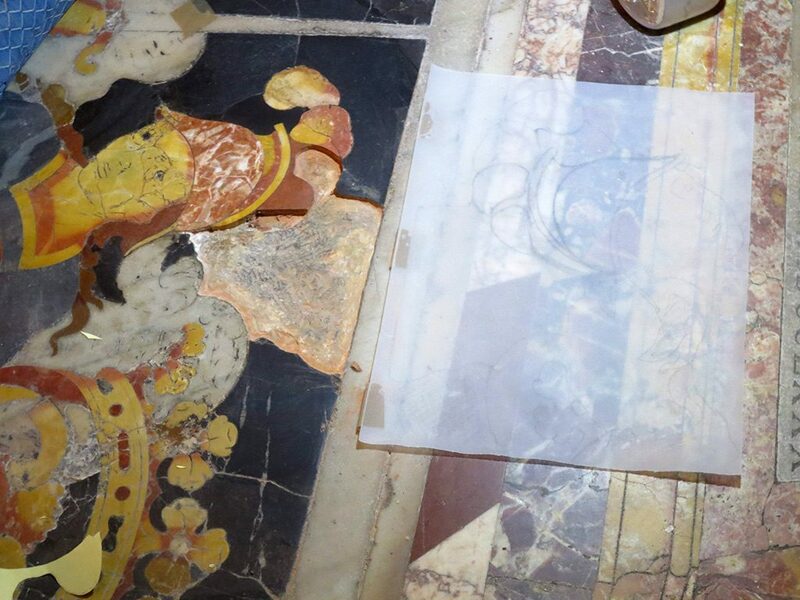 Pieces of marble had been removed and were being traced, presumably so that new replacement pieces could be cut. 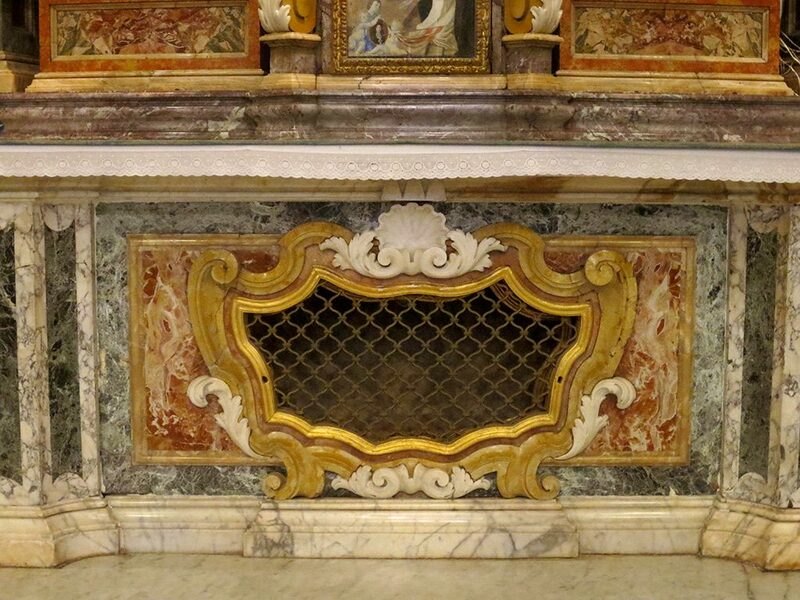 I guess a 500-year-old Cathedral doesn’t stay pretty all on its own. 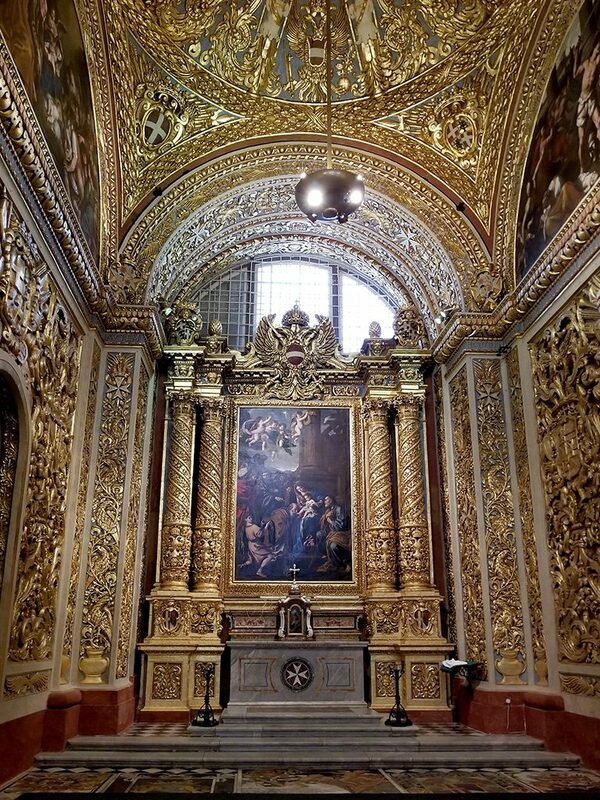 Each of the Knights Hospitallers Langues (major regional and language groups) received its own side chapel. 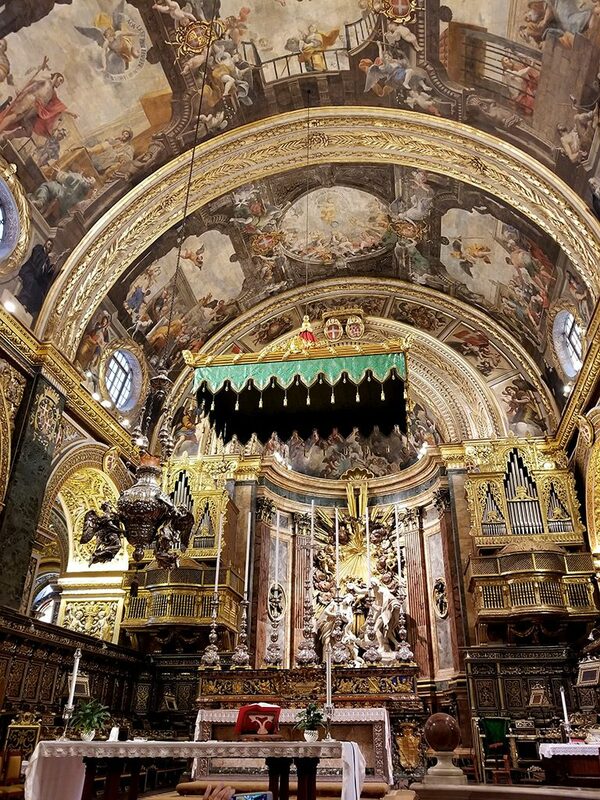 Those Langues deemed more important were given chapels closer to the main altar, and were decorated more elaborately, though frankly they all looked quite elaborate to me. 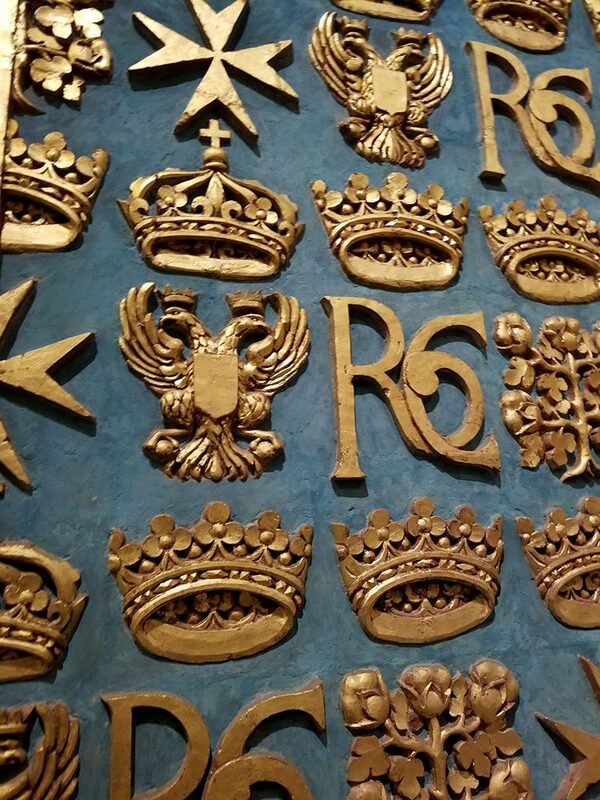 Some of the side chapels featured relics of their patron saints — generally something like a finger bone, or an item they owned. 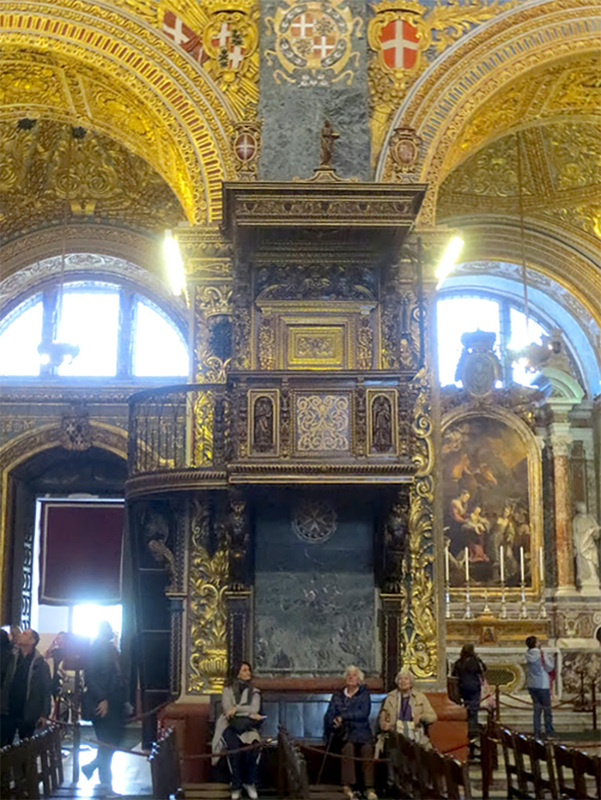 This particular chapel had as its relic the entire skeleton of its saint, piled in the classic “crossbones” position inside a grilled box for convenient viewing. 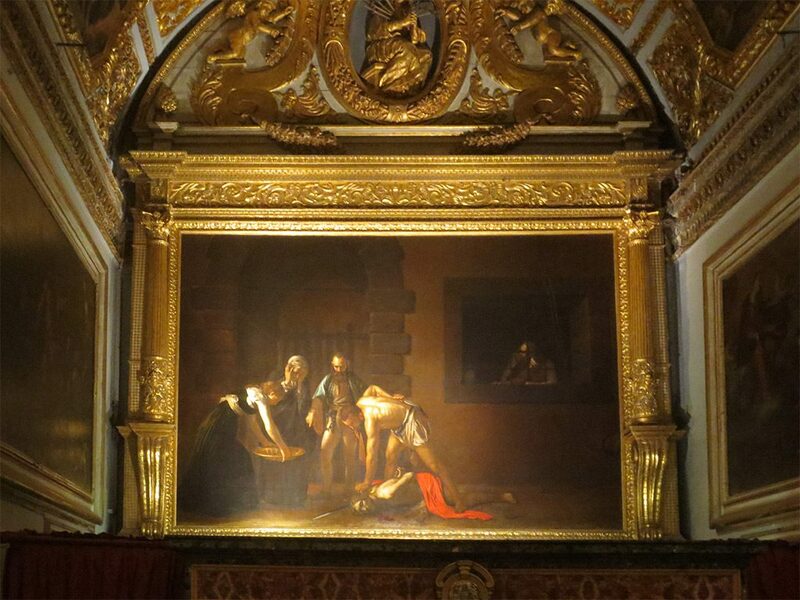 Initially celebrated and even welcomed into the Order of the Knights, Caravaggio soon fell back into his usual brawling ways and ended up imprisoned in a Maltese fort. 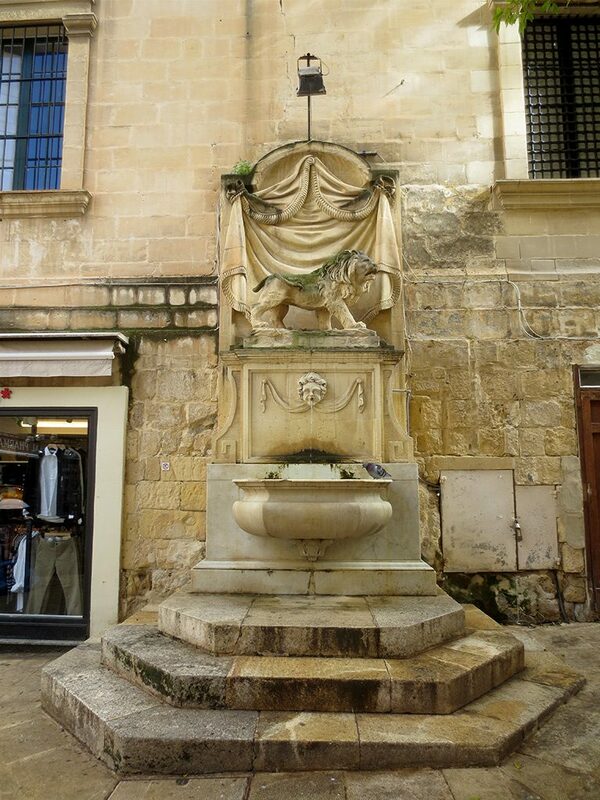 Stripped of his brief knighthood “as a foul and rotten member” he escaped Malta, headed back to what is now Italy, and died two years later at the age of 38. 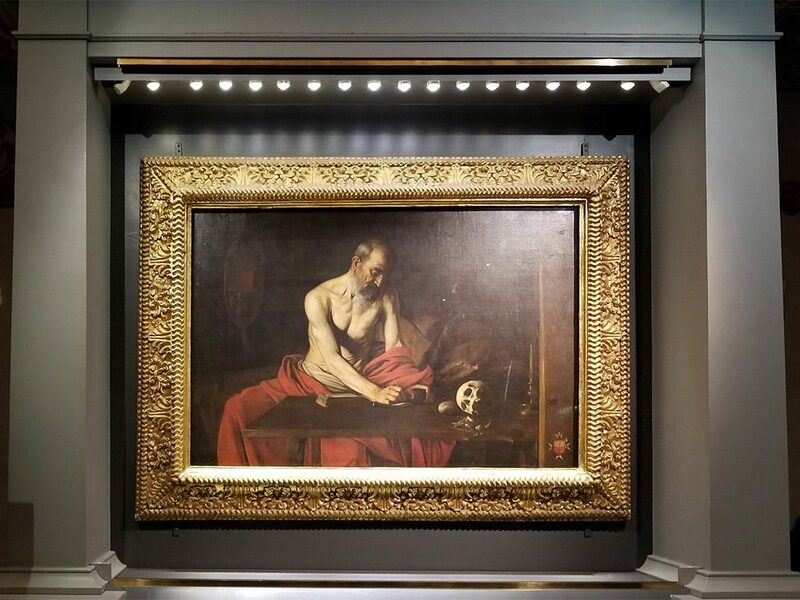 On the rear wall of the Oratory is Caravaggio’s lesser but still impressive Saint Jerome Writing. Both paintings were lit with spotlights that made them hard to photograph. This may have been intentional. Photos and stories from Josie and Gary&apos;s travels to various places. © 2019 Gary & Josie.